Why we need a DVD organizer? Massive DVD discs without organization seemingly swallow quite a large space of room and even involve the room into a clutter. And, it is not an easy task to dig out a desired DVD from discs thrown randomly. What's more, precious DVDs are probably broken or scratched if there is no protection. DVD organizer can handle all these problems. In this article, we will introduce several different kinds of DVD organization tools. Depending on your own needs, pick out the most helpful one to manage your big DVD library. Why not Convert DVDs to Digital File for Better Organization on Hard Drive? WinX DVD Ripper Platinum - features ripping DVDs to MP4, AVI, WMV, MOV, FLV etc, for better storing and managing on hard drive, sharing online or playing on portable devices. It can handle all kinds of DVD discs, including home-made and commercial copy-protected DVD movies/TV shows. It is also able to copy DVD to ISO image, VIDEO_TS folder and MPEG2 file at 1:1 ratio. Physical DVD organizer, also known as DVD storage, focuses on helping settle DVD discs. It can be a box, a bin, a cabinet, a shelf, a rack and even a storage tower for saving more discs, while some more innovative physical DVD organizers are designed for small spaces, such as drawers of TV stand/under bed, holder pin on the wall or a photo album for discs. It's not wise enough to just put all discs into your DVD organizer. To classify them can drive you to better organize DVDs. Gather one type of DVDs into one box, or a grid of cabinet and label them like Sci-Fi, Horror, Comedy, the title of TV series so that you can easily get wanted DVD. We suggest you to sort DVDs but it really takes too much time to organize numerous discs in order manually. So, DVD organizer software was developed to catalog DVD collections, which is capable of keeping track of your DVD only if you enter UPC/EAN barcodes from the case or just put the DVD into DVD-ROM drive. DVD organizer software also gives a filter option letting you search out DVDs you want to watch for fast as well as helps build a database to list DVDs borrowed by others. 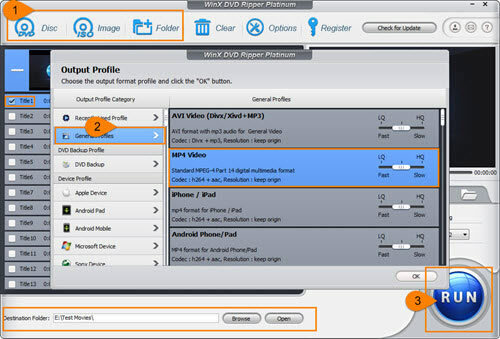 DVD Profiler, All My Movies and Movie Collector are the top 3 DVD organizer software. You can free download one of them for a try. DVD ripping software indeed doesn't work as DVD organizer directly but offers an efficient way for DVD organization as well. It can rip DVD to digital file for saving on computer. After that, DVD contents can be completely kept even though discs has been broken or lost. And, it's much simpler to manage digital files than DVD discs on computer. All above-mentioned DVD organizers can achieve DVD (disc) management. You can select the most appropriate one from them to get a well-organized DVD library according to your own needs. [Review] Top 5 Free DVD Rippers for macOS Sierra, El Capitan etc.